He had been chosen to ride in the first manned satellite to go out around the Moon and back to Earth. But when the satellite failed to orbit properly, it went on past the Moon into the vastness of outer space, and a whole world watched helplessly as he was borne toward an unthinkably lonely death. Yet destiny decreed that Kirk Hammond should suffer, not death but a pseudo-death. And he awoke from it to find that a hundred centuries had passed and that the space age which had begun in the 20th Century had now grown into a vast galactic civilization that had carried the sons of Earth to countless stars and worlds. But, unexpectedly, the conquest of space had changed Man himself, and the human race had become not one but several species. Hammond was plunged into the climactic struggle between the new races. And in his quest with a desperate band for the mysterious Star of Life that was the key to the struggle, in his relations with the strange and beautiful Thayn Marden who was not a human woman, in his odyssey through the mighty suns and earthly worlds of the galaxy, a man of the 20th Century found himself facing the dangers of the great space age which he himself helped pioneer. Wen dieser Plot so ein bißchen an "Buck Rogers" erinnert, der täuscht sich nicht. Allerdings wurde der Roman weit vor der heute bekannten "Buck Rogers in the 25th Century"-Serie herausgegeben. Aber es gab "Buck Rogers" ja schon früher. Zuerst tauchte er in der Story "Armageddon 2149 A.D." von Philip Francis Nowlan, veröffentlicht im August 1928 in AMAZING. Im folgenden Jahr, präzise am 07.01.1929, kam Buck Rogers in der heutzutage bekannten Form als Comic Strip heraus. Und dann gab es natürlich die Verfilmung von 1939 mit Buster Crabbe. "Buck Rogers" hat viele Leute inspiriert. Man denke nur an "Farscape", das ja auch deutliche Anleihen bei dieser Geschichte gemacht hat. Auch Romane gibt es viele, die diese klassische Serie zum Vorbild haben. 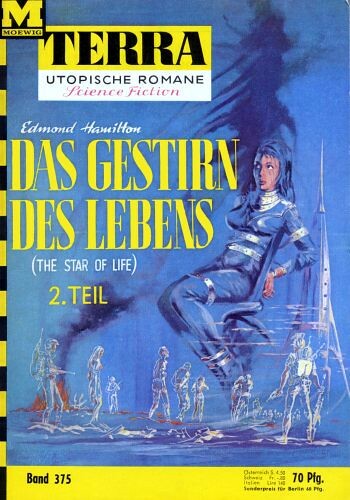 "The Star of Life" ist einer davon. Vielleicht nicht der beste, aber ich habe ihn genossen. 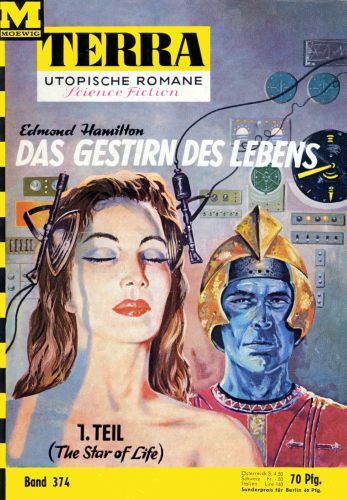 Edmond Hamilton, Spezialist für klassische Space Operas, hat auch hier wieder einen epischen Roman vorgelegt, den man durchaus gelesen haben sollte. Da man ihn gratis im Original lesen kann (siehe obigen Link), wünsche ich dabei viel Spaß.